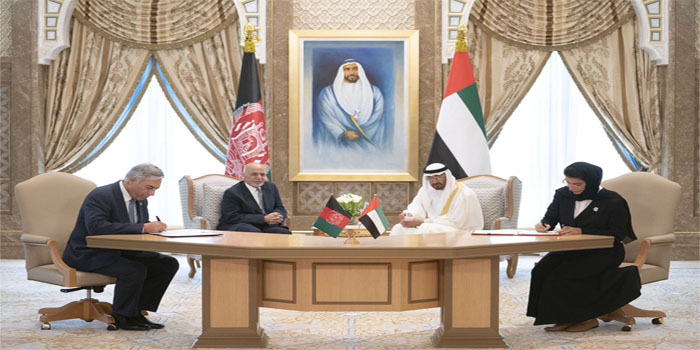 His Highness Sheikh Mohamed bin Zayed Al Nahyan, Crown Prince of Abu Dhabi and Deputy Supreme Commander of the UAE Armed Forces, and President Ashraf Ghani of Afghanistan, have witnessed the signing of a number of memoranda of understanding, MoUs, between the UAE and Afghanistan in education, culture and sport sectors with the aim to promote and develop joint cooperation between the two countries. The MoUs signed by the two sides at the Presidential Palace in Abu Dhabi cover areas of cultural cooperation, education, sports, mining, energy and agriculture. Dr. Anwar bin Mohammed Gargash, Minister of State for Foreign Affairs, and Mohammad Humayon Qayoumi, Afghanistan’s Acting Minister of Finance, signed four agreements on education, mining, energy, and sport cooperation. Qayoumi also signed an MoU on cultural cooperation alongside of Noura bint Mohammed Al Kaabi, Minister of Culture and Knowledge Development, and an agreement on agricultural cooperation with Dr. Thani bin Ahmed Al Zeyoudi, Minister of Climate Change and Environment. H.H. Sheikh Hazza bin Zayed Al Nahyan, Deputy Chairman of Abu Dhabi Executive Council; H.H. Sheikh Tahnoun bin Zayed Al Nahyan, National Security Adviser; H.H. Sheikh Khalid bin Mohamed bin Zayed Al Nahyan; Mohammed bin Ahmed Al Bowardi, Minister of State for Defence Affairs; Ali bin Hammad Al Shamsi, Deputy Secretary-General of the Supreme National Security Council; Khaldoon Khalifa Al Mubarak, Chairman of Abu Dhabi Executive Affairs Authority, EAA; Khaldoon Khalifa Al Mubarak, Chairman of Abu Dhabi Executive Affairs Authority; Mohamed Mubarak Al Mazrouei, Under-Secretary of the Abu Dhabi Crown Prince’s Court; Eisa Saif Al Dhaheri, UAE Ambassador to Afghanistan, and Maryam Eid AlMheiri, Director-General of Abu Dhabi Government Media Office, were present during the signing of the agreements. Also present was the Afghan delegation accompanying President Ghani to the UAE.